More a manual than a narrative, this book belongs on the shelf of every 21st century K-12 educator; it is an important work that provides the core knowledge and skills for college preparation education, and calls upon us to teach kids essential twentyfirst skills– problemsolving and critical thinking and scientific reasoning– in methods that are essentially 21st century, especially in the repeated call to connect the classroom to real-world problems. Our high schools must be more intentional about college preparation for all students, and define a graduate profile that precisely articulates the school’s understanding of a college prepared graduate. 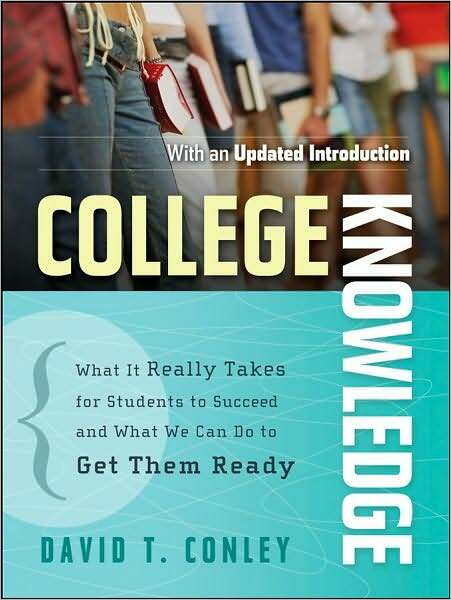 High school students should be given much more information, much earlier, about what college will demand of them, and what they need for college preparation. Conley particularly celebrates senior year “capstone courses,’ in all subjects, (which this blogger think to be especially “21st century”); an example would be a “problem-based” mathematics seminar: “Experts from the community in areas such as engineering, agriculture, and banking can serve as partners in the development of appropriately complex and challenging problems that students can address in such a seminar. The problems can link mathematical and scientific knowledge.” MORE….